Other Distinguishing Features: Grey skin and exposed teeth. 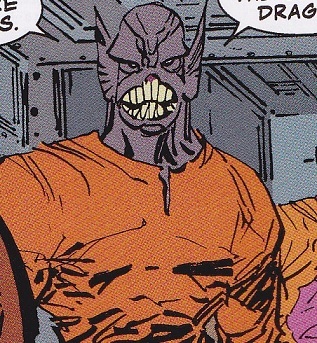 Ugly Johnny was a member of the Vicious Circle who was in prison while Dragon was imprisoned. He threatens Dragon, only to have his life threatened right back by Dragon. He is one of the many super-freaks who brutally beat Dragon while in prison. However, Dragon is able to bite off Ugly Johnny’s ear during the struggle.